Ooooh, this is one magazine I will never throw in the recycling bin. I agree with you wholeheartedly, I buy fashion magazines and never read them, and end up just cutting them up for various projects of my own. 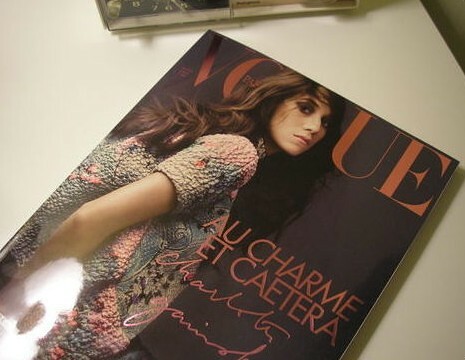 But I do love Charlotte Gainsbourg. I think I left a comment in your LJ once saying that your hair was perfectly chic, like a stylish French girl! French fashion magazines are like little dreams and they would be even more of a fantastic delight if they didn't leave me feeling so terribly graceless and disheveled. I just googled her, she does have a unique style. I'm so glad everyone else loves Charlotte! Aw, thanks Stephanie. I was thinking of taping a page from this magazine to my wall, but I don't have it in me to rip up this one yet.